The past decade has been marked by the deterioration in global freedoms and the emboldening of authoritarian regimes to undermine democratic ideals at home and abroad. The Statement rallies activists, governments, and citizens to push back against the wave of resurgent authoritarianism. Read the full statement below. 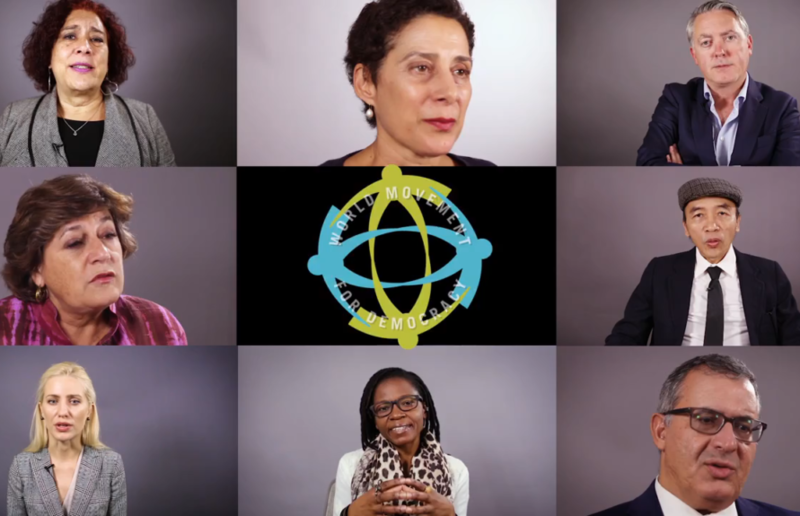 Watch the World Movement for Democracy’s video series, “A Call for Action – Voices from the Frontlines.” Our Steering Committee members tell their stories of advocating for democracy. Although their perspectives are unique, they are united in their belief that civil society is essential in defending freedom. How can you answer the call? Start here. Tamara Adrian (Member, Venezuela’s General Assembly) describes ways that Venezuelan civil society fills the gaps in social and information services and shows their resilience in bringing democracy back to Venezuela. Ladan Boroumand (Abdorrahman Boroumand Foundation) honors the memory of thousands of Iranian men, women, and children who have been murdered by the Iranian government. Glanis Changachirere (Institute for Young Women’s Development) is pushing back on Zimbabwe’s patriarchal and authoritarian society by empowering women to play an active part in their communities. Ana Gomes (Member, European Parliament) uses her role as a Member of the European Parliament to hold European governments accountable and fight on behalf of political prisoners. Robert Hårdh (Civil Rights Defenders) argues for a more innovative way to use technology and creative problem-solving to combat the growing number of threats against activists. Bambang Harymurti (Tempo International Media) highlights the critical role the free press plays to speak truth to power in both vulnerable and established democracies. Radwan Masmoudi (Center for the Study of Islam & Democracy) changed his life and career because he believed in Tunisia’s democratic future. Five years after protests brought down Tunisia’s authoritarian ruler, he reflects on the historic shift and what will protect Tunisia’s budding democracy. Svitlana Zalishchuk (Member, Ukraine Parliament) discusses her journey from journalist to activist to politician and the transformative power of social media in democracy movements.